Nancy is the old lady at our cafeteria. A very sweet and caring old lady always busy cleaning, billing and buzzing around. Everyday morning at work the "Good Morning" from her really cheers me up. For many things she reminds me of my ammamma (as in granny)Though nancy isn't that old the very way she carries herself is typical ammamma style. Very restless and active, always reading something or the other, the beaming smile and not to forget the glasses. Ammamma is 80 years old since yesterday. 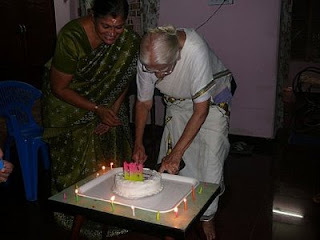 Her 77th birthday was like 2 days ago when we all went to guruvayoor. Dude time does flies like hell, aint it? With working parents it was most of the time me,shyama and ammamma at home. She would sit in the hall on her chair reading newspaper or some devotional books. Sometimes she even writes down some points from them to a diary for later reading. With hearing aid 'ON' she closely monitors what we do and sometimes gets real finicky asking lot of questions. The best part about her is she would start telling these stories from her past or her friends and gets immensely involved that she starts crying,laughing like the people in the story. I adore those moments because she has gone through so much in life that in the end i feel god has blessed me in every sense. Since i got this job i have been away from home, its her i miss the most coz she never speaks on phone. I miss those daily morning prasadams she brings from the temple and the sandalwood paste on the forehead. Then i used to remove them on the way to college as i felt they make me 'un-kool'. I miss her big lectures when i return back home all drenched in rain. Am sure she misses my crazy ways as well. Celebrating another ammamma birthdays without ammamma but this time around Nancy. Happy Birthday Ammamma!! Just saw your blog.I will call up your home tomorrow and wish her belated bday.And touch wood dude, may your ammamma live long enough to say all those stories to your kids! I Miss my Ammamma so bad. All my childhood memories are tied to my Ammamma. It's been 11 years since she passed but I feel like she i is always with us. Grandparents are the greatest treasure one has in their lives.